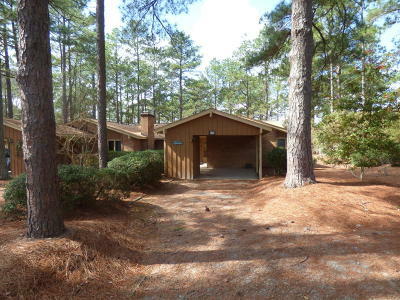 Single level home in adult community close to downtown Southern Pines. 2 bedrooms and a den for occasional guests. Entry opens to living room with 2 large skylights and fireplace. Kitchen has solid surface tops and wood like floor. Formal dining room plus a large Carolina room with additional 280 ft of heated space. Private back yard overlooks green space and driving range. Newer roof and heat pump.